Sympathy cards are often difficult to make. Sometimes you just don’t have time to spend on making them as you need one quickly. But also because sympathy cards are difficult to get just the right design elements. You need the right combination of images, sentiments and colours. For a sympathy card, you don’t want anything too bright, fancy, or glittery. 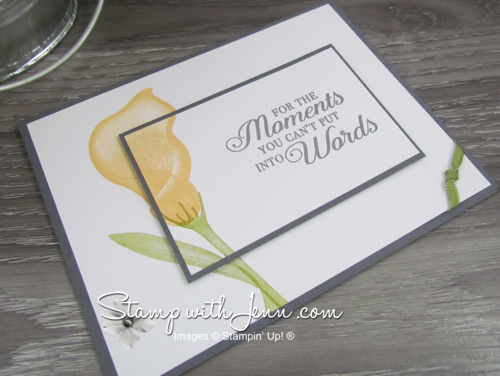 That is why I love this stamp set, Lasting Lily, from Stampin’ Up! It has some perfect images and sayings to help with your ideas for sympathy cards. The Lasting Lily stamp set has the main images of the pretty Lily Flowers and also a bunch of saying for the inside and the outside of the card. This stamp set is one that you can only get during Stampin’ Up! Sale-a-bration promotion. Sale-a-bration lasts until March 31st, 2019 and you can get this stamp set for free with any $120 order. See more about Sale-a-bration here. 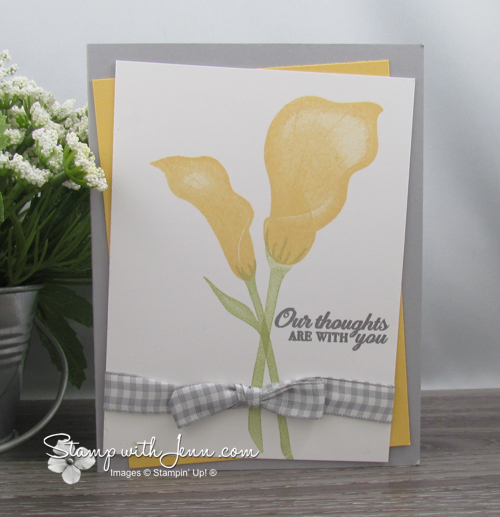 I love the soft yellow, So Saffron, and the light gray, Smoky Slate, colour combination for this sympathy card. It is soft and pretty and just perfect in its simplicity. I like how the layers are offset for a bit of interest and little hint of colour. Here’s another card with the Lasting Lily Stamp set using a different saying from the same stamp set. Attach the small white rectangle to the larger one with temporary adhesive. Stamp the flower image so that it lands partially off the smaller rectangle. Remove the small white rectangle and stamp the saying. Attach the small white stamped rectangle to a basic Gray card stock layer. Then re-attach to the large white with dimensionals (this will also help cover up any “white edges”). Add a small piece of knotted ribbon in the corner of the large white piece. 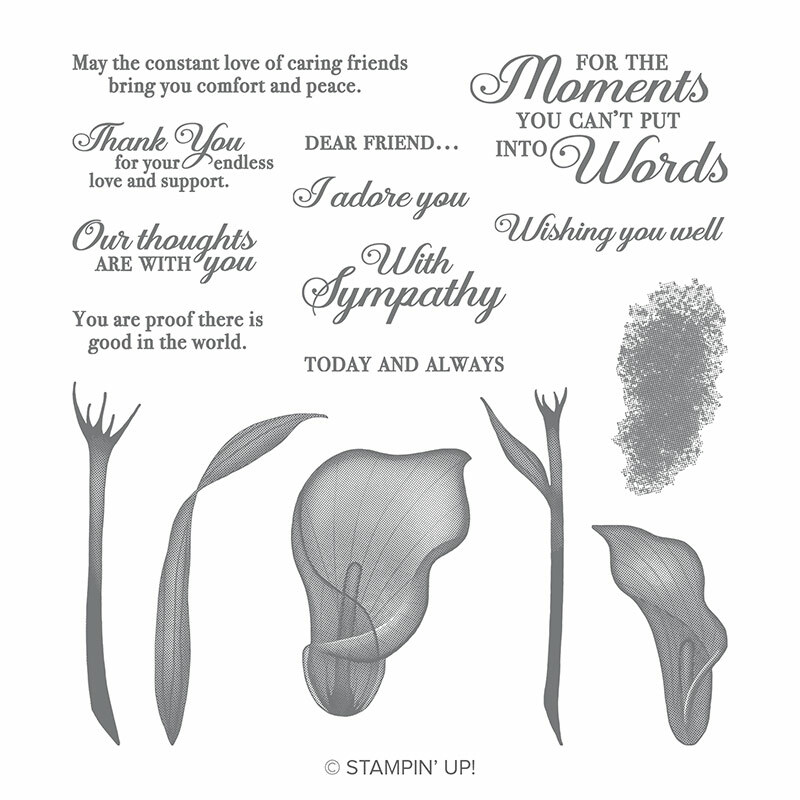 Although, I primarily like the Lasting Lily stamp set for Sympathy cards, it also has a couple of sayings that would work for Wedding, Anniversary, and get well cards. 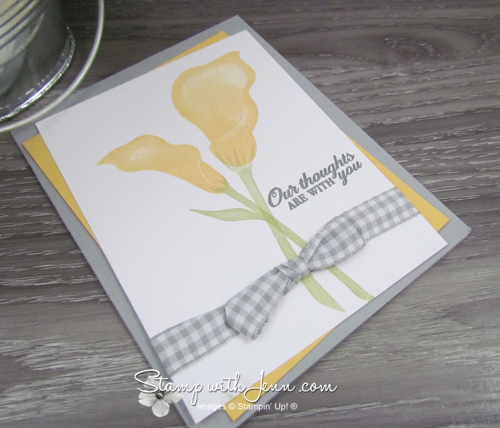 To find other Sympathy cards on my website at www.StampwithJenn.com, just type “sympathy” in the search box! 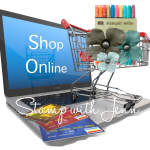 To shop Online and get the Lasting Lily stamp set before the end of March, click here.